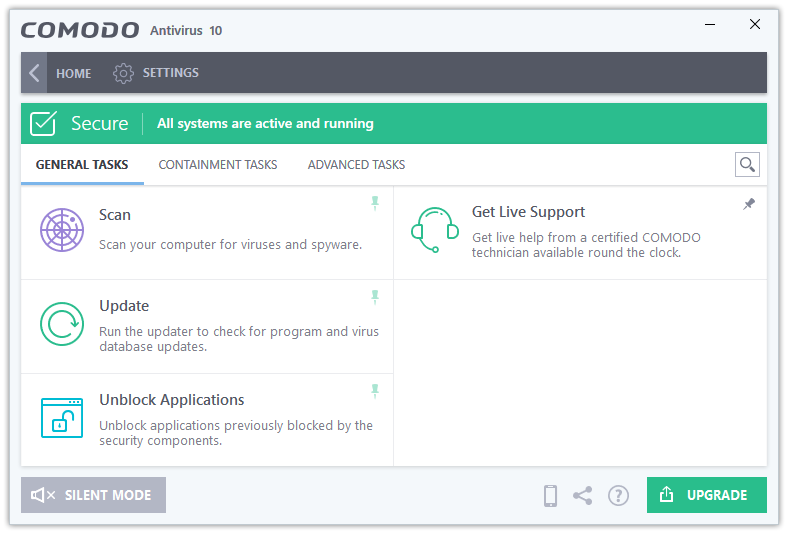 Home » PC » Antivirus & Security » Comodo Free Antivirus 2019 Review – Best Multi-Layer Protection for Windows 10. 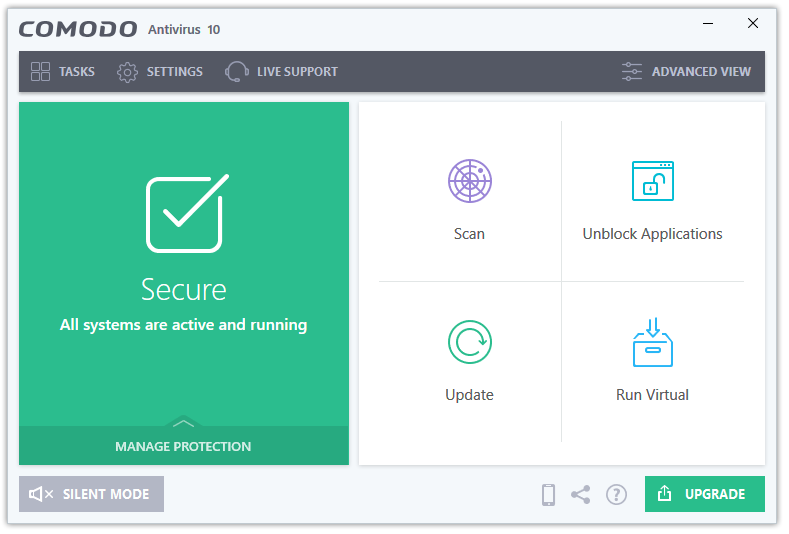 Best Free Antivirus Products for Windows PC in 2019 – Comodo Free Antivirus. Comodo Antivirus protects you using more antivirus technologies than any other free or paid antivirus product. If you use their Free Internet Security then you add one more layer to your protection, which is Firewall. Comodo Antivirus uses the following technologies to keep your computer safe from malware. Comodo Antivirus is the most polarising antivirus product in the computer security industry. It is loved by the enthusiasts for the multiple levels of protection that it provides, the configuration options supported by this program, the HIPS feature called Defense+ that intercepts each action performed by files and programs, the Virtualization feature called Sandbox that automatically runs a doubtful application in a virtualized environment, and Cloud protection. But, these advanced technologies bring some downsides as well. HIPS makes the program very talkative, something that most users don’t like. Sandbox may automatically run a legitimate program into a container, and there can be problems of False Positives. Anyway, these are secondary issues. The defence provided by Comodo is almost impenetrable. Virus Bulletin did not test COMODO in their most recent test. AV-Comparatives did not test COMODO in their most recent test. Click on the Tasks button to access the features offered by Comodo. All of the tools are organized in the following three categories. The General Tasks section includes general antivirus related options such as Scan, Update, etc. 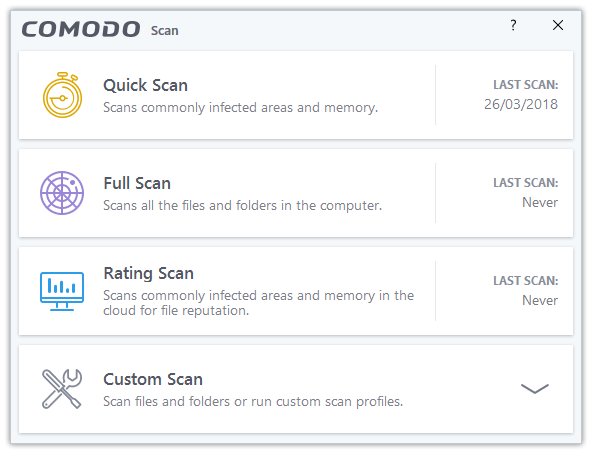 Scan opens Comodo’s Scan tool. 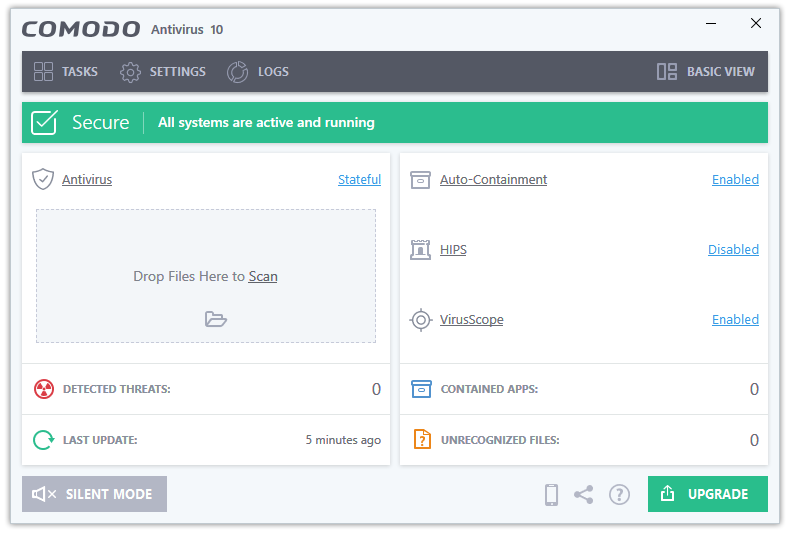 Comodo includes four types of scans – Quick Scan, Full Scan, Rating Scan, and Custom Scan. Update checks for product updates, and updates your software. Unblock Applications launched an important tool HIPS related tool. 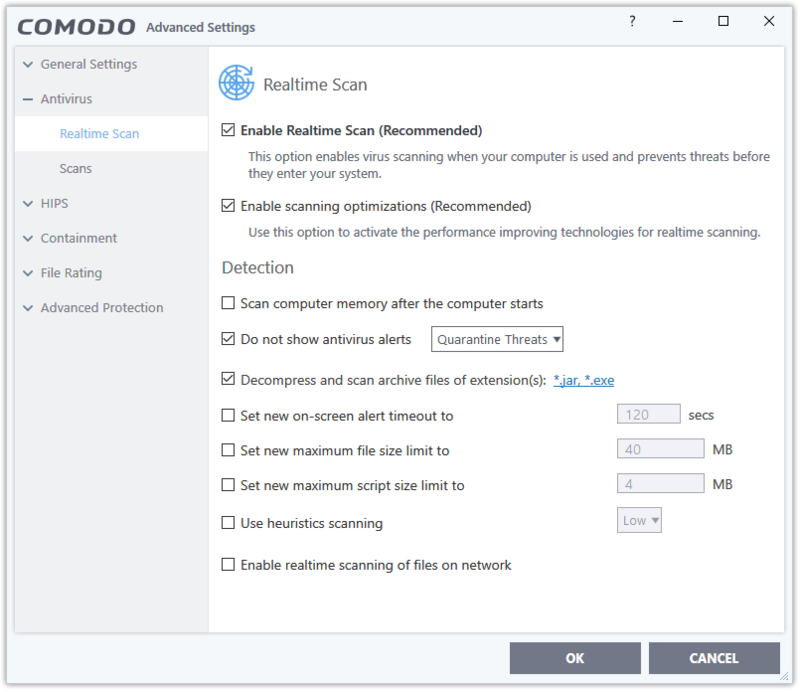 Comodo includes a lot of technologies to detect and remove malware, and they are very effective as well. However, sometimes, they result in False Positives. 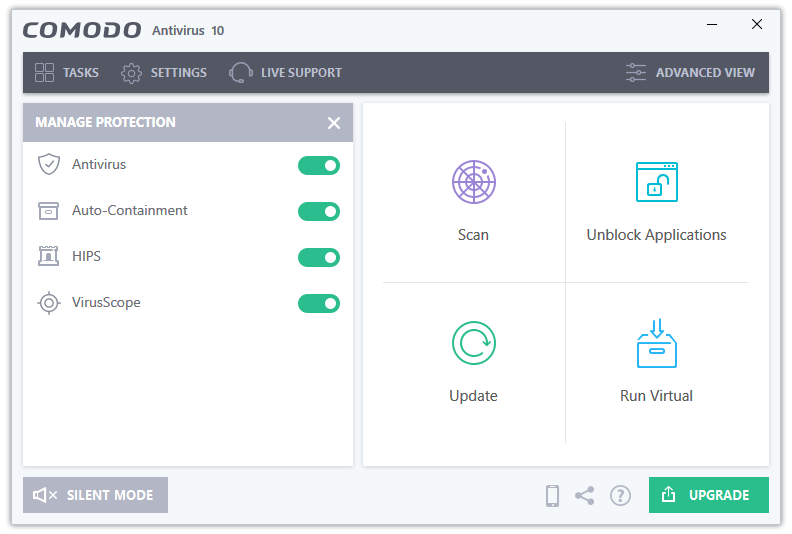 The Unblock Applications tool lets you unblock the false positives, the legitimate files that Comodo labelled as dangerous. Get Live Support is there if you want online tech support. The Containment Tasks section mostly covers Comodo’s Virtualization component called Sandbox, and its related processes. 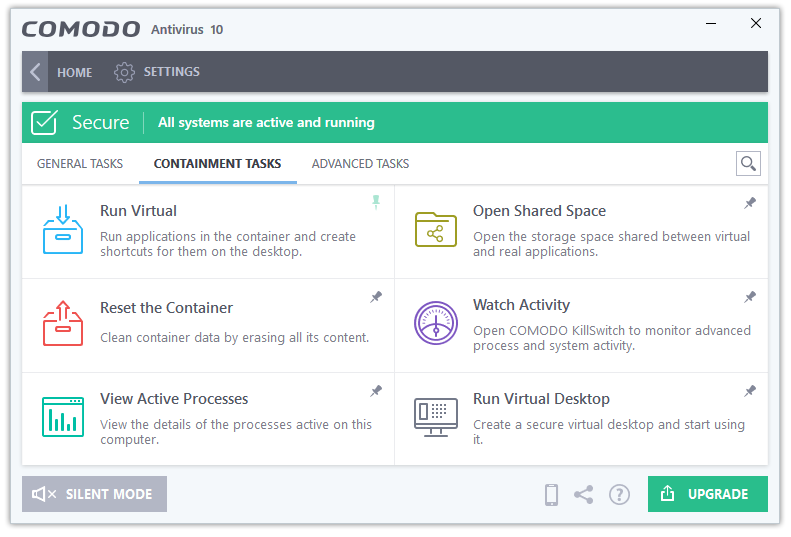 Run Virtual launches the Comodo Sandbox. Here, you can browse for the application executables that you want to run in a contained environment, a Sandbox. Reset the Container resets the data of the Sandbox container. View Active Processes shows you the details of the processes currently active on your system. Open Shared Space is another sandboxing related feature, which opens the storage space shared between your sandboxed and non-sandboxed applications. Watch Activity launches Comodo’s advanced Task Manager called COMODO KillSwitch, which can be used for monitoring and managing processes and system activity. Run Virtual Desktop is an advanced feature that creates a Virtual Desktop. The Advanced Tasks section includes the advanced tools offered by Comodo. 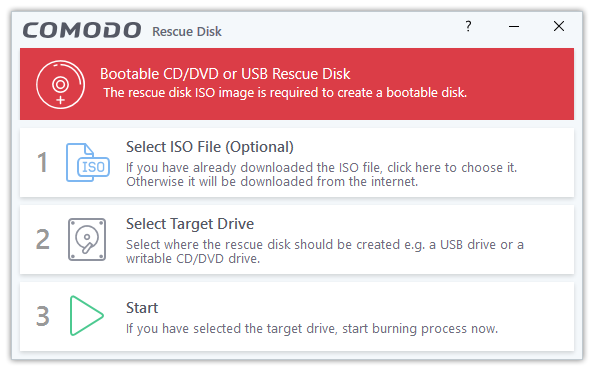 Create Rescue Disk option launches Comodo’s Rescue Disk creator utility, which you can use to create a bootable Antivirus Rescue Disk for Windows. 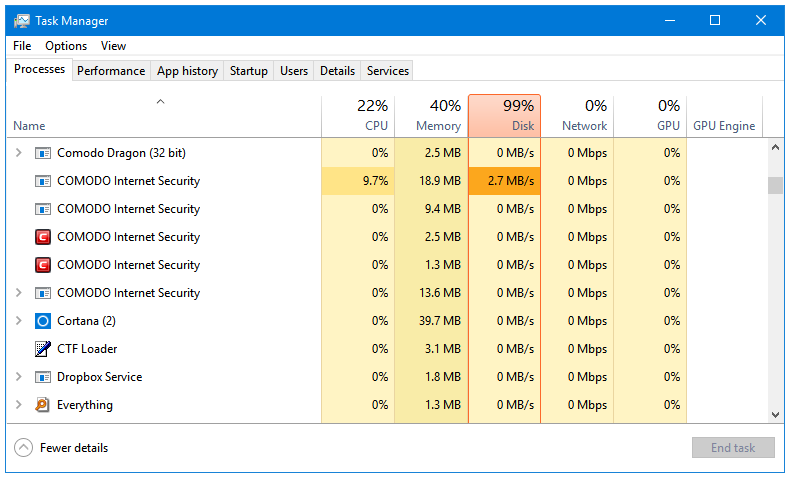 Open Task Manager opens Comodo’s own Task Manager that you can use to see the processes running on your system. View Logs displays the computer security related events. Clean Endpoint uses Comodo’s computer security toolkit called COMODO Cleaning Essentials to detect and remove malware from your computer. View Quarantine button takes you to the Quarantine section, which contains the files detected as malware. You can perform additional operations of the quarantined files such as Delete. Submit Files lets the user submit files to Comodo for analysis. The Settings can be accessed by clicking on the Settings button in the program toolbar. 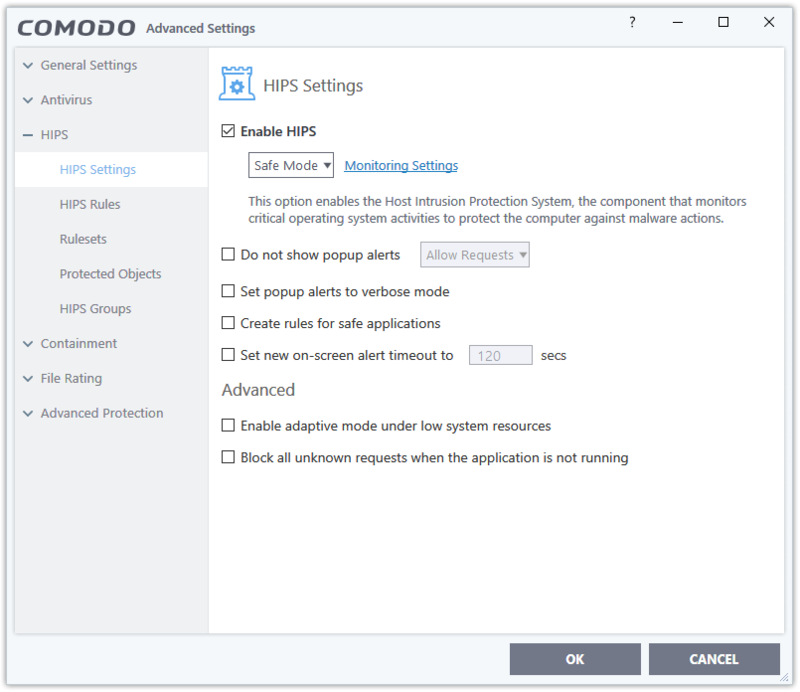 Here is a look at the various Settings available in the Comodo Antivirus. Hard Disk Used: The installer is around 75 MB in size. After installation and an update, the Comodo Free Antivirus uses around 500 MB of the disk space. CPU and RAM Usage When Idle: COMODO is one of the most lightweight Antivirus programs. It uses only about 25 MB of RAM when it is idle. The CPU usage is stable at 0%. 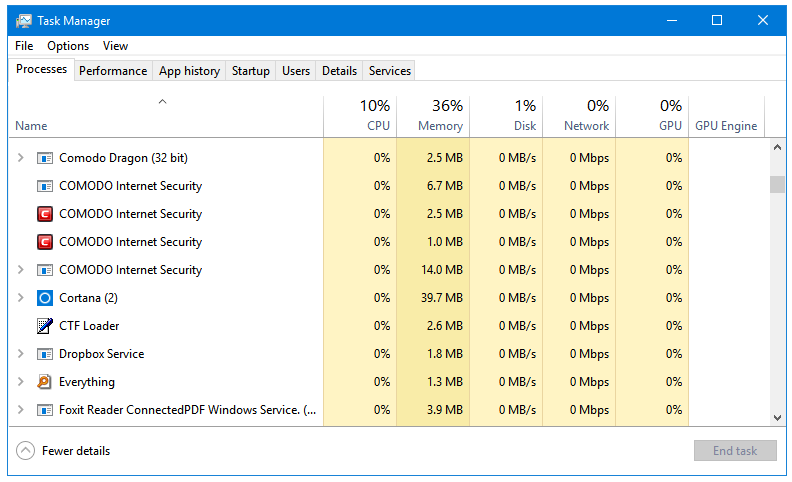 CPU and RAM Usage When Scanning: Even you are performing Full scan with COMODO, it only uses around 50 MB of your RAM. The CPU usage fluctuates between 5 to 15%, and is stable at around 10%. 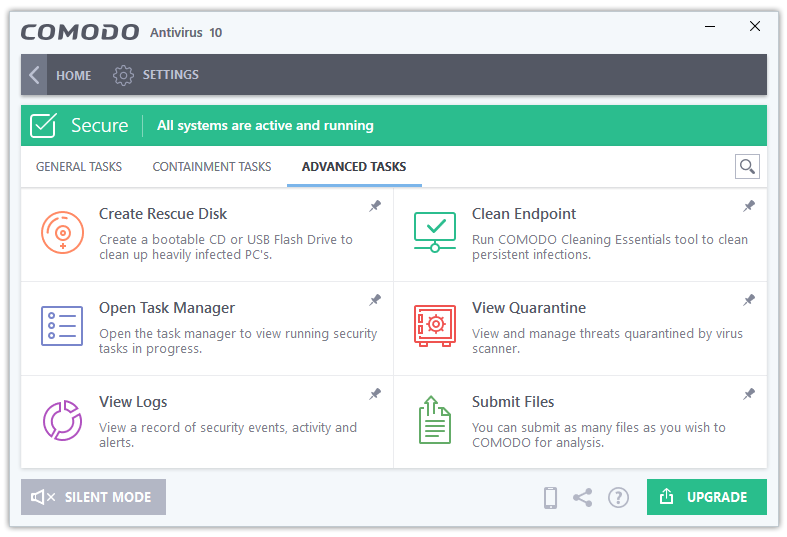 Comodo is the only Free Antivirus that has an in-built Theme support, the latest version comes with four Skins. There is one for each kind of user. If you like the current Flat design language, then you can use the Modern theme. 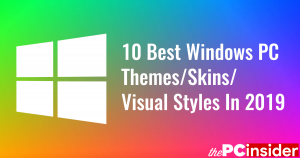 If you prefer the all glossy colourful design language of the past decade then Classic is the one for you. The default theme of Comodo Antivirus is called Lycia, and the one used in Comodo Cloud Antivirus is called Arcadia. So, a lot of options in the theming department. There are two Home view available for users – Basic View, and Advanced View. The Tasks button in the program toolbar takes you to the features of Comodo Antivirus, which are already covered in the Features section in this review. The Settings button takes the user to their dedicated Settings window. This is the place where you can make your Comodo product completely your own. You can completely personalize it, and configure it to work and behave the way you want it to. The Live Support button takes you to Comodo’s Premium support. The Silent Mode button enables or disables the Silent Mode feature in Comodo. The Silent Mode disables all kinds of Pop-ups and Sounds made by Comodo Antivirus. The Uprgade button is a promo to purchase Comodo’s paid protection. The Upgrade button is turned on by default. But you can easily disable by turning off its option in the settings. The Advanced view has the Logs button in place of Live Support. The Logs window displays a record of Comodo Antivirus and the computer security related events. Comodo has a few issues. 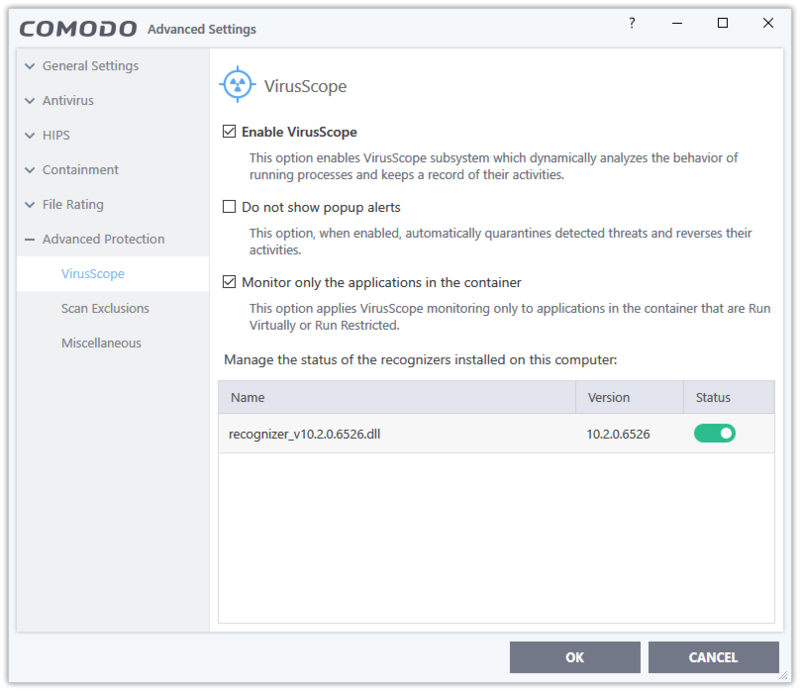 During installation, it downloads and tries to set their own web browser software called Comodo Dragon as system default, even if you don’t agree to it.. It tries to change the home page, new tab page and the default search engine of your web browser(s) to Yahoo. The good thing is that, this time, it obeys the user. You can untick the option, and Comodo won’t make changes to your web browser’s these three settings. When Comodo detects malware on your system, it displays a pop-up window about GeekBuddy, Comodo’s paid malware removal service. There is an Upgrade button in Comodo’s interface, but you can disable it easily from its General Settings. There is also an option can that be disabled from the General Settings window.